Algae is central to this installation, a magical microorganism believed to be the source of all life. It collects solar energy, and through photosynthesis creates 70% of the atmospheric oxygen we breathe each day. It is often seen as a hazard but the potential for algae as a renewable energy source, for economical, sustainable food for the future and for cleaner air confirms its relevance today. 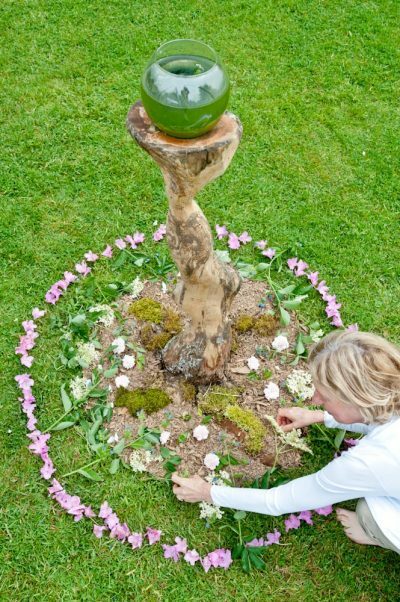 Visitors are invited to make a wish for themselves and the planet over the water and algae. 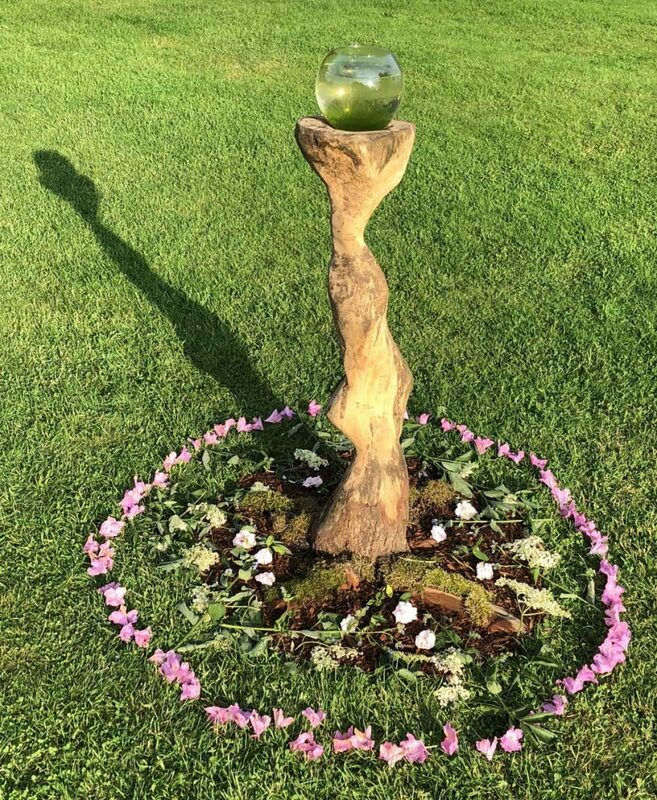 Water carries memory – it was collected from the sacred Chalice Well at Glastonbury and the intentions set in the water throughout the exhibition will be honoured as part of a ceremony to celebrate the Summer Solstice on June 21st at 7.00pm. There will be a mandala, poetry and music ritual – all welcome, admission free. Venetia expresses a visceral connection to the earth and taps into the primal, human ability to regenerate, recycle and transform. She creates ecologically conscious artworks and is inspired by the alchemy of the elements and the rhythms of nature with its cycles of birth, life, death and renewal. The Greek classical elements of earth, fire, air and water were considered the building blocks of all matter. ‘Regenesis’ is a homage to this elemental connection. Wood from a loved, dying cedar tree was used to create the sculpture – creation often emerges through destruction and dead matter can be transmuted. Changing states alter our perceptions. ‘When you change the way you look at things, the things you look at change’ (Dr, Wayne Dyer).